The Wisconsin fisher is a large weasel-like animal with a pointed snout, small eyes and a bushy tail. It is a member of the “Mustelidae” family, which means “one who carries away mice”. Its’ scientific name is “Martes pennanti”. “Martes” means martin and “pennanti” refers to a Welch naturalist after whom it was named. 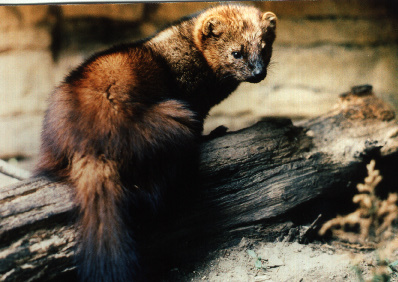 The Native American name for the fisher was “bone crusher”. Presently, Wisconsin has 19 species of furbearers. 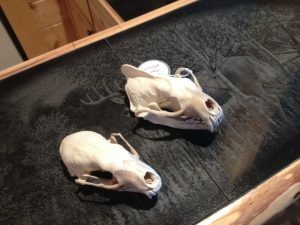 Sixteen are in the order “Carnivera”, two others being rodents (muskrat and beaver) and a single marsupial (opossum). Other members of the Mustelid family include the least, short-tail and long-tail weasels, river otter, mink, badger, wolverine and pine martin. The male fishers are larger than the females and will weigh up to 15 pounds while the females top out at 5-8 pounds. The quality of the female’s fur is much softer and more luxuriant. 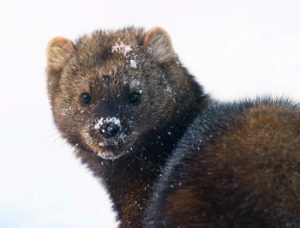 The fisher also exhibit what is called sexual dimorphism which means the males will look much different than the females. The skulls of the males have a high sagittal crest and will also have much larger canines. Their home range can be 4-10 square miles while they have been known to range up to 38 square miles. One fisher per square mile is about the optimum density however. In the wild a fisher can live several years but have been shown to survive in captivity for up to ten years. Fishers are one of the few predators of the porcupine. Porcupines can have a serious effect on northern forests due to the girdling of the bark on valuable timber trees as the feed. Reintroduction of a porky predator might help curb an over-abundance of this, at times, destructive rodent. Fishers will eat just about anything that moves and along with taking a porcupine if the chance offers itself, a domestic cat can also be on the dinner menu of a fisher. The recent reintroduction effort has provided Wisconsin with a valuable resource that had been missing for many years. While fishers are a forest creature, logging and fires had greatly diminished their range and habitat in the early 1900’s. Over harvest also affected their numbers. In 1920, a prime pelt of a fisher could fetch up to $300.00 which was a huge amount of money at that time. The fisher season was officially closed in 1922 and the last reported sighting of a fisher in Wisconsin was in 1932. In 1956-1963 fishers from New York and Minnesota were released in the Nicolet Forest in Forest County and in 1966-1967 more were reestablished in Bayfield and Ashland Counties. Following these successful stockings of fishers, the resourceful animal has repopulated most of northern Wisconsin. In 1985 a successful harvest season was established when the animals reached a critical population point. I saw my first set of fisher tracks back in 1988 while grouse hunting along the Flambeau River with my son Matt and friends near Ladysmith in Rusk County. I saw my first live fisher while deer hunting near Cumberland in Barron County in 2001. Since that time, the fisher have been moving south with sightings becoming more frequent even in this area. I now have them coming into my feeders eating the meat scrapes and several folks have reported seeing large mink-like animals crossing the road near New Richmond, Hudson and Somerset. The fishers appear to be on the move and expanding their territory! This, like the reintroduction of the wild turkey, is another Wisconsin success story!